NATO A LIVORNO NEL 1943, FORMATO ALL’ACCADEMIA DI ROMA E ALL’ÉCOLE DES BEAUX ARTS DI PARIGI; PITTORE, SCULTORE, ARCHITETTO E MAESTRO D’ARTE CREATIVA IN AFRICA, ARMANDO TANZINI HA CONOSCIUTO E FREQUENTATO ANDY WARHOL, SEBASTIAN MATTA E LARRY RIVERS;HA VISSUTO A ROMA, FIRENZE, PARIGI, LONDRA E, DOPO UN LUNGO SOGGIORNO NEGLI STATI UNITI, SI È TRASFERITO A MALINDI. IN AFRICA SPOSA L’ARTE TRIBALE, UN INCONTRO CHE CONTAMINA IL SUO STILE ETRUSCO-RINASCIMENTALE E LO SPINGE VERSO UNA RICERCA ARTISTICA IBRIDA, METICCIA; UN’ANTOLOGIA ARCHEOLOGICA DEL PRESENTE TRA LA TOSCANA ED IL KENYA. PREMIATO DALL’UNESCO PER LA SUA “DO NOT FORGET AFRICA FOUNDATION”, TANZINI HA ESPOSTO ALLA 50ESIMA BIENNALE DI VENEZIA E A QUELLA DI MALINDI. LA SUA PRIMA PERSONALE E STATA A ROMA NEL 1962 -IL PENSIERO CREA LA FORMA, É IL SUO LEITMOTIV. AT A VERY YOUNG AGE HE REGULARLY WENT TO THE STUDIO OF A LIVORNO PAINTER AND FRIEND OF THE MODIGLIANI, AND THEN STUDIED AT THE LICEO ARTISTICO IN FLORENCE, THE ACADEMICA DELLE BELLE ARTI IN ROME, AND THE ÉCOLE DES BEAUX ARTS IN PARIS. HE HAS BEEN AWARDED MANY PRIZES, INCLUDING THE PREMIO VIAREGGIO, THE PREMIO FATTORI, AND THE PREMIO PIOMBINO. AFTER BEING INVOLVED IN THE STUDENT MOVEMENT IN PARIS IN 1986, HE MARRIED THE DAUGHTER OF AN AMERICAN ARMY COLONEL AND LIVED IN ARLINGTON. AFTER HIS DIVORCE, HE SPENT A SHORT WHILE IN ROME, AND THEN MOVED TO AFRICA WHERE HE DISCOVERED TRIBAL ART. 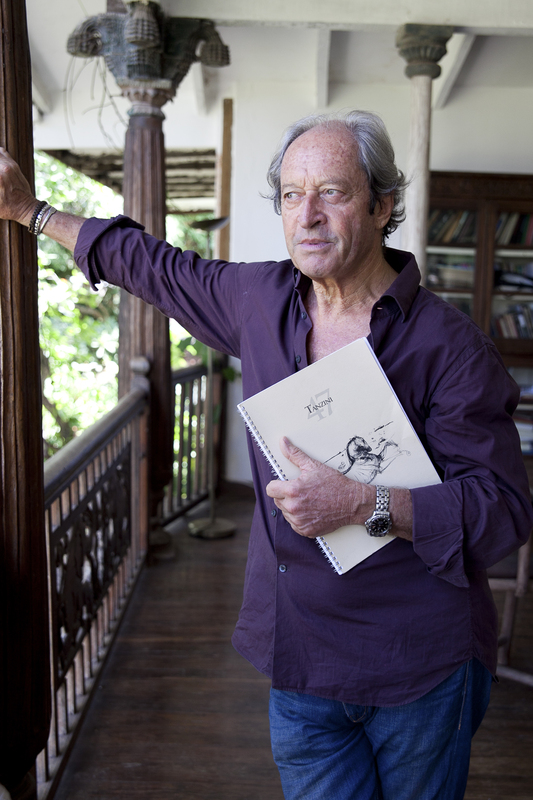 IN KENYA HE ABANDONED PAINTING AND MAINLY DEVOTED HIMSELF TO ARCHITECTURE AND SCULPTURE. HE HAS DESIGNED AND BUILT SEVERAL PUBLIC AND PRIVATE BUILDINGS AND CREATED THE NAIROBI SAFARI PARK. HE ALSO TRAVELS AND STAYS IN SANTA MONICA, CALIFORNIA, AND IN INDIA. HE WAS AWARDED THE UNESCO PRIZE FOR HIS DO NOT FORGET AFRICA FOUNDATION. HIS FIRST SOLO EXHIBITION WAS IN ROME IN 1962. RECENTLY, HE HAS EXHIBITED AT THE CLASSICITÀ E PRIMITIVISMO EXHIBITION AT THE MUSEO DI SANT’APOLLONIA, VENICE 2002, AND THE FOLLOWING YEAR AT THE KENYA PAVILION DURING THE 50TH “BIENNALE DI VENEZIA”.